I’ve got a few important announcements, so I’ve decided to compile it all in one post! Starting tomorrow until November 18, Sophie’s Mom Mckinley & Makati branches (only) will be accepting donations for Typhoon #YolandaPH victims. 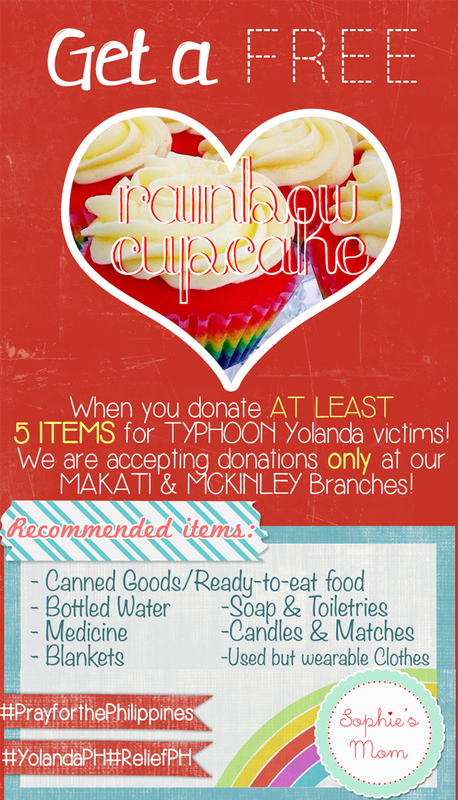 If you donate AT LEAST 5 ITEMS (please see recommended items), as a token of our gratitude, you will receive a Rainbow Burst Cupcake from us! A sweet treat and likewise a symbol of hope after this great storm and hurdle our nation is facing today. Let’s all try to help in any way we can, no matter how small! These donations can really go a long way when done collectively and a source of life and hope for our fellow Filipinos! Want to be one of the 8 BB TOP MODELS next year?! Click read more for more details! MAYBELLINE NEW YORK is on the lookout for 8 ladies who will be the 2014 Top Models of 8-in-1 Clear Smooth BB! Because MAYBELLINE Clear Smooth 8-in-1 BB gives you perfect skin with its 8 healthy benefits, we’re looking for all aspiring models who believe they have what it takes to be one of 8 MAYBELLINE NEW YORK BB Top Models who will represent Clear Smooth 8-in-1 BB in a photoshoot and win a P100,000 modeling contract with Ideal People Models. (3) One-sentence statement on why they believe they should be a MAYBELLINE BB Cream Top Model. *Ages 15-17 are required to submit parental permission to participate. Candidates should collect as many votes as possible for a chance to be part of the finals. Each voter is allowed to vote a candidate only once, and can vote for up to 10 candidates. The top 30 candidates who get the most number of votes will be invited to a casting on December 6, 2013. The jury composed of representatives from MAYBELLINE NEW YORK and Ideal People Models will select the Top 8 winners. The highest scoring model will receive an exclusive 1-year modeling contract worth P100,000 with Ideal People Models, one of the country’s most reputable modeling agencies, while the runner up will receive a P50,000 contract.